[London: 16 November 2016]: EcoWorld Ballymore, one of London’s most prominent property developers, today announces its partnership with The Line, east London’s contemporary art walk. This new collaboration will see The Line develop and deliver the public realm strategy at London City Island, creating public art commissions to be a permanent feature of the island and extending the riverside art programme to the development. The collaboration will also see The Line establish an artist-in-residence programme, occupying studio space on the island, and a ‘hub’ space where people can meet, get information on The Line, and also see exhibits. The Line is London’s first dedicated modern and contemporary art walk, an inspirational outdoor exhibition space for East London. The route currently runs between the Queen Elizabeth Olympic Park and The O2, following the waterways and the line of the Meridian. Its world-class ambitious sculptures, from the likes of Gary Hume, Eduardo Paolozzi, Abigail Fallis and Damien Hirst, are set against the ever-changing backdrop of east London. Telling a narrative of the area’s industrial past and present, the pieces all represent a rich construction of mechanisation and modernisation. The contemporary art walk aims to encourage people to engage with contemporary art and the urban environment as well as educate themselves about the area’s local history, wildlife and heritage. London City Island, dubbed the ‘mini Manhattan’ of London, is a 12 acre island development which will deliver 1,700 new homes. Boasting a 260ft iconic red bridge, built by Ballymore to link the island to Canning Town, the development is one of the best connected developments in the Capital with fast access to Canary Wharf (4 minutes), the West End (Bond Street in 20 minutes) and the City (London Bridge in 11 minutes). The new neighbourhood, which has recently welcomed its first residents, includes independent artisan restaurants, shops, and al fresco spaces. The first of the island’s leisure offering, The Island Grocer, opened earlier this month, providing a grocery and restaurant for residents and the surrounding area. The Island Grocer sets the benchmark for the retail and leisure spaces for the island. In addition, the gym and iconic red outdoor swimming pool are now complete, which will form part of the residents Arts Club, a private resident’s club with screening room and concierge service. A place for art and culture, the island will soon welcome English National Ballet, English National Ballet School and The London Film School. 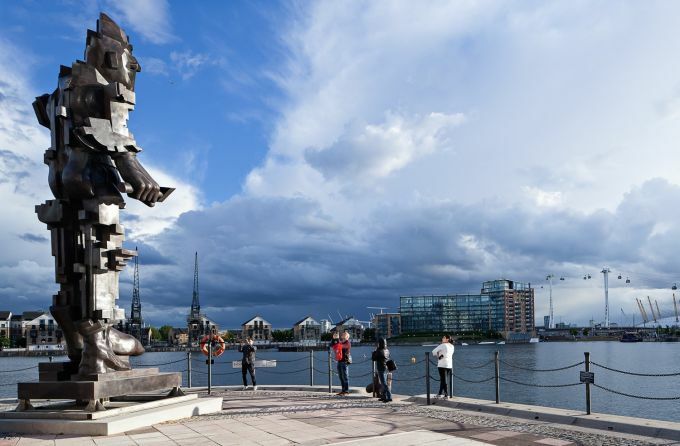 Residents of London City Island and the surrounding area will be able to attend film screenings and Q&A evenings with the London Film School and the school will use the public open spaces of the island as set locations, activating these spaces and bringing the craft of filmmaking alive. English National Ballet will occupy architecturally outstanding rehearsal spaces designed to enable passers-by to experience the ballet’s magic as they pause to watch rehearsals through floor-to-ceiling windows. In addition, the new English National Ballet School will make use of outside public spaces at London City Island, bringing ballet closer to the lives of these new east Londoners. Eco World Ballymore is formed of Eco World International Berhad, an international property developer with presence in the United Kingdom and Australia, and Ballymore, who have over 20 years’ experience in the London property market. The two companies share the vision of creating some of London’s most exciting and innovative residential developments. Their joint venture represents a careful balance of investment in three of the most important waterside development projects in London’s future, both east and west: Embassy Gardens, London City Island and Wardian London.